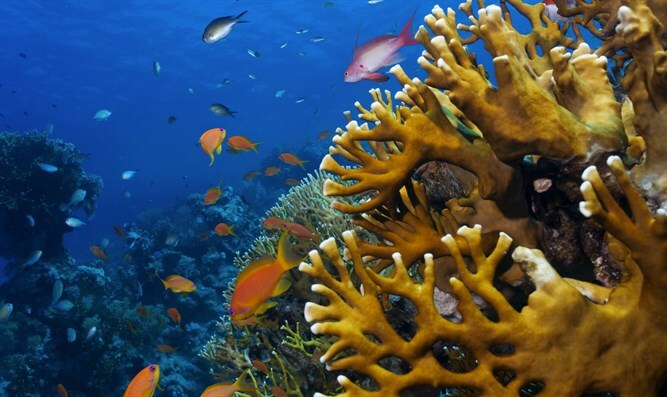 New study finds coral reefs in the Gulf of Aqaba may survive global warming. Coral reefs in the Red Sea’s Gulf of Aqaba can resist rising water temperatures, a new study found. If they survive local pollution, these corals may one day be used to re-seed parts of the world where reefs are dying. Coral reefs are dying on a massive scale around the world, and global warming is driving this extinction. The planet’s largest reef, Australia’s Great Barrier Reef, is currently experiencing enormous coral bleaching for the second year in a row, while last year left only a third of its 2300-km ecosystem unbleached. The demise of coral reefs heralds the loss of some of the planet’s most diverse ecosystems. Now, scientists at EPFL (Ecole polytechnique fédérale de Lausanne) and UNIL (Université de Lausanne) in Switzerland and the Mina and Everard Goodman Faculty of Life Sciences at Bar-Ilan University and the InterUniversity Institute of Marine Sciences in Israel, have shown that corals in the Gulf of Aqaba in the Northern Red Sea are particularly resistant to the effects of global warming and ocean acidification. The results of the study were recently published in the journal Royal Society Open Science. The implications are important, as the Gulf of Aqaba is a unique coral refuge. The corals may provide the key to understanding the biological mechanism that leads to thermal resistance, or the weakness that underlies massive bleaching. There is also the hope that the Gulf of Aqaba Reefs could be used to re-seed deteriorated reefs in the Red Sea and perhaps even around the world. The scientists performed the first detailed physiological assessment of corals taken from the Gulf of Aqaba after exposure to stressful conditions over a six-week period. They found that the corals did not bleach. At the InterUniversity Institute for Marine Sciences in Eilat, scientists exposed corals of the species Stylophora pistillata, collected from the Gulf of Aqaba, to water temperatures and acidification. The conditions resemble the summer conditions of a future ocean in this region if local ocean warming continues at its current rate of approximately 0.4-0.5°C per decade. They performed an overall health check of all the major physiological functions of the corals, measuring variables like energy metabolism, the ability to build a skeleton, and nutrient exchange at the molecular level between the coral-host and their algae symbionts. These physiological variables were mostly unaffected by the harsh experimental treatment. Still, further work on ecologically relevant variables like fertility or competitive performance is needed. Symbiotic corals live together with an algae partner, much in the same way humans are in symbiosis with gut bacteria. Just as bacteria in the gut aid with digestion, providing valuable nutrients to the rest of the body, the algae that live within the coral-partner provide nutrients to the corals. The bacteria in our body thrive within our digestive tract, just as the algae benefit from living within the coral partner. Bleaching occurs when the colored algae are ejected by their coral-partner, and the symbiosis breaks down. If the algae do not return, the coral dies. The coral species stylophora pistillata which occurs in other regions of the world, and beyond the Gulf of Aqaba, does not necessarily demonstrate thermal resistance. The biological mechanism that underlies the robustness of the Gulf of Aqaba Reefs is still unknown, but the scientists have an idea of how the species evolved to become thermally resistant. “Corals in the Gulf of Aqaba are pre-acclimated to thermal tolerance due to the special geography and recent history of the Red Sea,” says scientist Prof. Maoz Fine of Bar-Ilan University's Mina and Everard Goodman Faculty of Life Sciences and the InterUniversity Institute of Marine Sciences. At the end of the last ice age, corals started recolonizing the whole of the Red Sea through the southern connection to the Indian Ocean. The thermal bottleneck at the southern entrance with summer water temperatures rising to 30-32°C provided a selective barrier, allowing only highly resistant individuals to move north. Ironically, this heat-resistant founding population encountered much cooler waters once reaching the northern end, where the Gulf of Aqaba is located. Based on this, the study hypothesized that these corals might be able to better cope with today’s ocean warming, considering that they not only descended from a heat-selected founding population, but they also started their warming trajectory from a lower temperature, compared to their counterparts in the central and southern Red Sea. Despite being resistant to global warming, the corals from the Gulf of Aqaba are still vulnerable to other stresses like pollution. “Local disturbances, such as local oil pollution, nutrients from fish farms, herbicides from gardening, may reduce the exceptionally high tolerance of the Gulf of Aqaba Reefs,” says Fine. “This reef should receive international recognition as a natural site of great importance, because it might very well be one of the last reefs standing at the end of this century,” says Anders Meibom of EPFL and UNIL.